The EU is at a crossroads of constitution and conscience. Unity in Adversity argues that EU market citizenship is incompatible with a pursuit of social justice, because it contributes to the social exclusion of women and children, promotes a class-based conception of rights, and tolerates in-work poverty. The limitations of EU citizenship are clearest when EU nationals engage with national welfare systems, but this experience has been neglected in EU legal research. 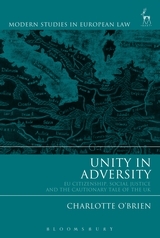 Unity in Adversity draws upon the ground-breaking EU Rights Project, working first hand with EU nationals in the UK, providing advice and advocacy, and giving ethnographic insight into the process of navigating EU and UK welfare law. Its study of EU law in action is a radical new approach, and the case studies illustrate the political, legal and administrative obstacles to justice faced by EU nationals. Taken together, the strands demonstrate that 'equal treatment' for EU nationals is an illusion. The UK's welfare reforms directed at EU nationals are analysed as a programme of declaratory discrimination, and in light of the subsequent referendum, should be treated as a cautionary tale – both to the EU, to take social justice seriously, and to other Member States, to steer away from xenophobic law-making. Shortlisted for the 2018 BBC Thinking Allowed Award for Ethnography. Winner of the 2019 Hart-SLSA Book Prize. 9. Is European Social Justice Possible?